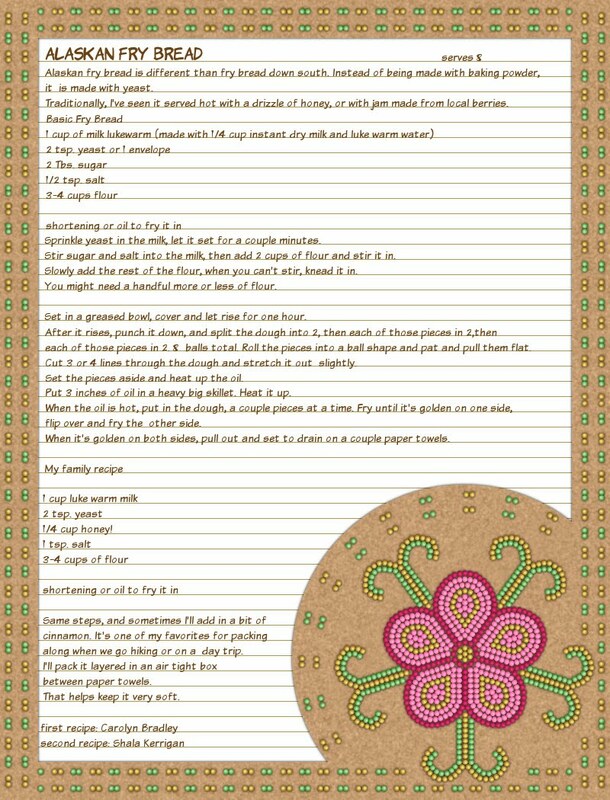 Don't Eat the Paste: Alaskan Fry Bread- printable recipe! Alaskan fry bread is different than fry bread down south. Instead of being made with baking powder, water, flour and salt, it is made with yeast, flour, dry milk,water, salt, and usually some sort of sweetener. Just like a yeast bread recipe. Traditionally, I've seen it served hot with a drizzle of honey, or with jam made from local berries. Sprinkle yeast in the milk, let it set for a couple minutes to make sure the yeast is alive. If the milk gets a bit foamy, it's alive. Stir sugar and salt into the milk, then add 2 cups of flour and stir it in. Slowly add the rest of the flour, when you can't stir, knead it in. You might need a handful more or less of flour. Set in a greased bowl, cover and let rise for one hour. After it rises, punch it down, and split the dough into 2, then each of those pieces in 2,then each of those pieces in 2. 8 balls total. Roll the pieces into a ball shape and pat and pull them flat. Cut 3 or 4 lines through the dough and stretch it out slightly. Set the pieces aside and heat up the oil. Again, traditionally, Crisco is used because it kept well. I use canola oil. Put 3 inches of oil in a heavy big skillet. Heat it up. When the oil is hot*, put in the dough, a couple pieces at a time. Fry until it's golden on one side, flip over and fry the other side. When it's golden on both sides, pull out and set to drain on a couple paper towels. Well, I love baking bread. I make up recipes for bread regularly. So it was only natural that at some point I'd start playing with my old fry bread recipe. My family is wild for whole wheat breads, and I like fry bread plain. Nothing on it, but just a little sweeter. Again, we do use instant dry milk. Same steps, and sometimes I'll add in a bit of cinnamon. It's one of my favorites for packing along when we go hiking or on a day trip. I'll pack it layered in an air tight box between paper towels. That helps keep it very soft. A little history, if you want to skip it, just scroll down to the printables! My mother came up to Alaska in the 60s as a Vista volunteer. It was one of the best times in her life. She taught school in villages, and came away from it with a deep abiding love for Alaska, and the people and way of life up here. And the occasional craving for Spam and pilot bread. The first recipe is the one I learned from her. 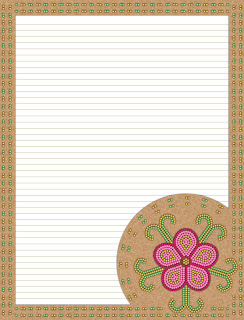 The beadwork on the printable is based on Athabaskan beadwork. I'm half Athabaskan so it seemed appropriate. 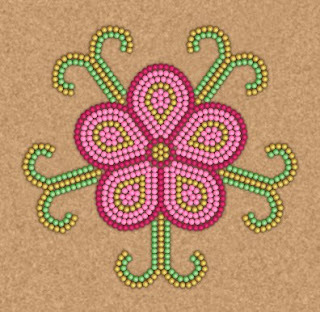 Athabaskan beadwork before missionaries and traders was based on geometric patterns. That changed with missionaries and glass seed beads. 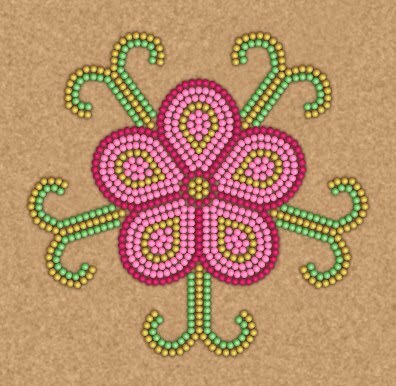 Now most traditional Athabaskan beadwork is floral motifs done in couching method on moose hide or other rough tanned leather. The motif I chose is Alaska's prickly rose. The printables are at 100 ppi, click on the images to get the full sized version. If you print them on US letter sized paper at 100% they will have perfectly even borders. Honey is simply brilliant. I wouldn't have thought of it. Thank you for sharing your recipe! Going to try today. I am Aluet and was never taught how to make this. cant wait to try! I lived in the Aleutian Islands for 7 years. The locals in my village called fry bread "alaadix", and it was my favorite. I always ate mine plain, but most people would eat it with butter and homemade jam or jelly. Boy do I miss alaadix!! Thanks for the recipe and stories. Reading her books always makes me hungry and inspires me to bake. She describes food here so well. I've been reading her books lately and that is what got me looking to see what fry bread is. Sounds good, gonna try it. My husband is 1/2 Athabaskan. He remembers making this bread in school when he lived in Alaska. I am about traditional foods. My 3 kids and I will be cooking up this really soon. Thank you for sharing this with us. I am looking for a traditional Aleutian Island meal recipe I can make for my family in Texas. We have started around the world foods and this weeks is the Aleutian Islands and I cant find anything other than this fry bread. HELP!